As a researcher in the arena of childhood and youth, in particular how cultural narratives impact on children and young people it is not unusual that personal experience impacts upon the topics that I choose to study. One such incident occurred last year, following a conversation with a friend of nearly 50 years. Spurred on by my musings on the events of my teenage years, I repurchased some 1970s teenage publications and looked upon them again with professional adult eyes. Looking through the montage covers of these publications at the smiling idols of the era, I began ticking off how many had died at a young age, and in tragic circumstances. I was also simultaneously working on a project that focused on issues around ‘Adverse Childhood Experiences’ (ACEs), a concept based in the finding that events creating insecure emotional development in childhood impact upon lifelong physical and mental health, resulting in a lower life expectancy of 20 years for those with the highest ACEs score. Beginning to wonder if there might be a connection between the concept of ACEs and the number of early deaths of so many of those who had been idolised by teenage girls of my generation, I carried out a quick straw poll of people featured on the cover of FAB208 annuals from 1972-75, who I rated as relatively enduring major stars. Eight of those still living had never featured in the media with respect to addiction problems. Eight who had died, and two who were still living had all featured in publicity relating to addiction, some explicitly citing emotionally disrupted childhoods. Alcohol was named as the major source of substance abuse in five of these cases. This is a very small sample, so any conclusion can only be indicative; however, it shows a larger proportion of early death and addiction than would generally be expected. While still contemplating this finding, I carried out a literature search relating to research on ACEs in general, and found a reference to more secure findings that tied the ends of my thoughts together: performing artists with a high ACEs score tended to be more intensively creative than those who experienced more secure, loving childhoods. All of these ideas were still circulating in my mind when the news broke that 1970s teen idol David Cassidy had become yet another of those to die at a comparatively young age, having experienced various difficulties throughout his life. On Monday 11th June, a TV programme aired in the US which followed Cassidy recording his last album Songs my father taught me, a tribute to his father, a ‘debonair and dashing … bipolar, manic depressive alcoholic’ who left his mother when Cassidy was only three and a half. In the programme, Cassidy reflects on his childhood memories of his father, commenting upon being ‘an abandoned child, but I worshipped him’. This documentary therefore unwittingly constitutes a poignant case study of the complex mixture of talent and anguish in a creative, sensitive performer that has been previously described in academic research. For example Marie Forgeard found that the number of adverse childhood events reported by her sample of 373 participants predicted breadth of creativity, leading Scott Kaufman to contemplate a new rationale for the use of creative therapies, such as art and drama for those with high ACE scores. In 2015 Paula Thompson and Victoria Jacque found a link between shame and fantasy in dancers, working from a theory of fantasy as a coping strategy, and in later, larger scale research, found that performing artists with high ACE scores were more able to enter what is known as a ‘flow state’, losing themselves in their performance. Chiraag Mittal found that while research typically finds that people with high ACE loads lack impulse inhibition, which can have negative consequences, the mirror image of this quality is the ability to shift attention quickly: ‘an aspect of cognitive flexibility, which is thought to underlie abilities such as creativity’. All of this made contemplating the documentary about Cassidy’s last project even more emotionally harrowing than it otherwise would have been, especially as my first ever pop concert had been one in which he starred. The poignancy of the documentary’s narrative was further exacerbated by a bitter note; public dissemination of a conversation recorded by a journalist on her iPhone of a clearly ailing Cassidy explaining that while he was experiencing dementia-like symptoms, he had recently been informed by his doctors that these were not caused by the neurological degeneration associated with Alzheimer’s Disease as he had previously thought, but by his drinking. I am very familiar with the insidious fear of mental decline that is typical in a person in later life who has watched the demise of two relatives who developed the condition; in Cassidy’s case, his mother and grandfather, and in mine, my mother and my paternal aunt. From this perspective, it would have been quite reasonable up to this point for Cassidy to have presumed that his increasing forgetfulness was due to the onset of Alzheimer’s. What he appeared to be doing in the recorded conversation was explaining that he had just been given an alternative diagnosis for his condition. Sadly and somewhat predictably however, the popular press overwhelmingly presented this phone call as the ‘sensational’ aspect of the documentary, in articles with disingenuous headlines similar to the Daily Mirror’s ‘David Cassidy admits he LIED about having dementia to cover up his drinking’. In conclusion, it is very sad to see a person whose performances brought pleasure to millions, and who clearly experienced adverse events in childhood, being posthumously presented in this fashion. Part of being ‘ACEs and trauma aware’ means not framing the key question as ‘what is wrong with you?’ but instead ‘what happened to you?’ Recent contemplation on David Cassidy’s life has led me to consider that perhaps we should not only be applying this practice in individual, personal interactions, but also to people in the public eye, and that our media should attempt to become more ACEs and trauma aware, not least in the wake of recent high profile suicides. ‘See the funny little clown/ See the puppet on a string/ Wind him up and he will sing, give him candy he will dance/ But be certain not to feel if his funny face is real’. More than half (51%) of adults who were abused as children experienced domestic abuse in later life, new analysis has revealed1. Domestic abuse includes sexual assault, non-sexual abuse and stalking by a partner or family member. The CSEW defines domestic abuse as occurring after the age of 16. Child abuse includes psychological and physical abuse, sexual assault, and witnessing domestic abuse. A child is defined by the CSEW as a person under the age of 16. Around one in five adults aged 16 to 59 (an estimated 6.2 million people) had experienced some form of abuse as a child, according to the Crime Survey for England and Wales (CSEW) for the year ending March 20162. But the impact of what is often a hidden crime does not always end there. A higher proportion of survivors of child abuse went on to experience domestic abuse in adulthood, compared with those who suffered no childhood abuse. Those who survived more than one type of child abuse were more likely to experience domestic abuse as an adult than those who survived fewer types of child abuse, the analysis found. Survivors of all four types of child abuse were the most likely to suffer domestic abuse; 77% had experienced domestic abuse after the age of 16, compared with 40%3 who experienced one type of abuse as a child. More than one in three (36%) of those who experienced abuse by a family member as a child were abused by a partner as an adult. 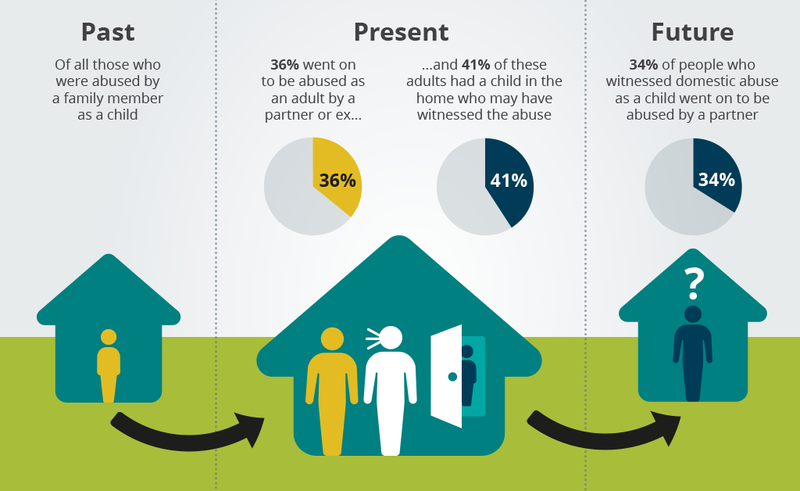 The data also show that adults who witnessed domestic abuse as a child in their home were more likely to experience abuse by a partner as an adult (34% compared with 11% who did not witness domestic abuse). Almost a third (31%) of adults who were abused as a child reported also being sexually assaulted as an adult4, compared with 7% of those who did not experience abuse as a child. Women who were survivors of childhood abuse were four times more likely to experience sexual assault after the age of 16 than male survivors (43% compared with 11%). More than half (57%) of women who were survivors of child abuse experienced domestic abuse as an adult, compared with 41% of men. Overall, women were five times more likely to suffer sexual assault as an adult than men (20% compared with 4%), and twice as likely to experience domestic abuse (26% compared with 14%). Roughly one in six adults who were abused as a child had experienced domestic abuse in the previous year. Young adults (aged between 16 and 24) who were abused during childhood were most likely to have experienced domestic abuse in the previous year5. than those who had not experienced abuse as a child (12% compared with 8%). They were also almost twice as likely to report having a long-standing illness or disability compared with those who were not abused as a child (28% compared with 15%)6. At the same time, 78% of child abuse survivors said their health, in general, was “very good” or “good”, compared with 87% of those who did not experience abuse as a child. Survivors of childhood abuse rated their well-being as lower than adults who did not experience abuse as a child. They were less likely to be happy, satisfied with life and feel their lives were worthwhile than those who were not abused as children. A spokesman for child protection charity, the National Society for the Prevention of Cruelty to Children (NSPCC) said: “A child’s experience of abuse must never dictate their future, which is why we work directly with victims to help them recover and get their lives back on track. “Although survivors may bear the scars of their experiences, this should not define who they are. Previous research has looked into the impact of Adverse Childhood Experiences (ACEs) on later life. These are stressful experiences during childhood and include abuse, neglect and growing up in a household with mental illness or alcohol or drug abuse. The research has primarily focused on the impact of these experiences on health and well-being, finding that they can lead to adopting health harming behaviours, such as smoking, and can have life-long consequences to health, for example National household survey of Adverse childhood experiences and their relationship with resilience to health-harming behaviors in England and Adverse Childhood Experiences and their impact on health-harming behaviours in the Welsh adult population. Other research, looking at the implications of child abuse and maltreatment, has also shown similar findings. A literature review for the NSPCC , called the Costs and Consequences of Child Maltreatment found that these experiences as a child could have many different implications on the individual in later life, such as forming and maintaining relationships, mental health problems and an increased likelihood of experiencing violent treatment from an intimate partner. This commentary is not intended to imply causal relationships; it is rather a summary of the main findings and significant differences between characteristics. The total number of people to have experienced domestic abuse as an adult was 6.6 million. All differences described are statistically significant at the 5% level. Sexual assault can occur outside of domestic abuse if carried out by somebody who is not a current or former partner or other family member of the victim. This may be a continuation of the abuse experienced as a child. We don’t know whether they had the long-term illness or disability at the time of the child abuse or not, nor whether it was caused by the abuse. We had a brilliant time last week at The BRIT School in Croydon celebrating the wonderful work of their Year 13 FMP Student, Sam Sutherland who we awarded joint first prize for his short film entry in our 70/30 Short Film Contest 2018 (#7030ByMe). He was presented with his £500 cash prize in a larger-than-life cheque by CEO of WAVE Trust, George Hosking. The BRIT School were also awarded their half of the £750 cash prize for the winning school! Head of film and media, Graham Chalk was there along with the Principal of the school to receive their part of the prize. Fellow students and friends and family of Sam’s joined us to watch his film and celebrate his winnings – we had quite some fun with our new 70/30 Instagram frame too! Sam’s work will undoubtedly help us spread the crucial message of preventing child maltreatment to many audiences across the UK, including the younger generation. We’re honoured to have had such high quality material produced on our behalf. Congrats Sam – you did us and your school very proud!